Canola futures headed for their steepest loss in almost 10 months after Canadian growers confirmed that top buyer China has halted all purchases, alleging shipments from Canada were contaminated. The oilseed crop for delivery in May fell 2 per cent to $459 a metric ton at 10:10 a.m. in New York on Friday. A close at that level would be the worst day for a most-traded contract since June 1. The Canola Council of Canada said Thursday that China had stopped all purchases of Canadian product. The confirmation follows a March 1 statement by Richardson International that China had suspended its licenses after claiming shipments had pests and bacteria. 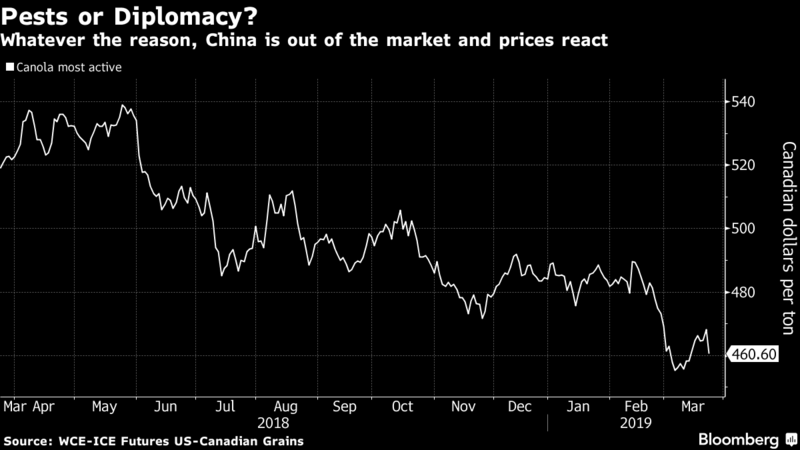 Canadian officials say that haven’t found any evidence of pests, and Richardson, the country’s top canola exporter, signaled the decision to restrict its shipments may be linked to an escalating diplomatic row with China over the detention of a Huawei Technologies Co. executive. Canola seeds are crushed for oil used in everything from salad dressing to deep-frying. Canola is also used as livestock feed. Data released Friday by Statistics Canada showed February crushing was down 6 per cent from the same month last year.